At the mouth of Clew Bay stands Clare Island, an island full of history and made famous by the Gaelic pirate queen Grainne Mhaol. For almost two centuries, the island’s Lighthouse has been a nautical landmark perched high on the craggy cliffs, watching over Achill, Westport and beyond. 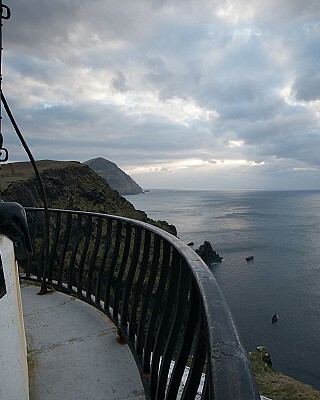 Once a safe haven for sailors, Clare Island Lighthouse now offers sanctuary of a different kind. This architecturally majestic, listed building has been lovingly transformed into fully catered, luxury accommodation, complemented by magnificent sea views from its imposing tower and an inspiring, natural environment. Visitors to the Lighthouse can escape the world of hustle and bustle and lose themselves in one of the most spectacular landscapes and most unhurried environments Western Europe has to offer. Clare Island Lighthouse is a retreat like no other, a special place where guests are free to while away their time in solitude or to enjoy mingling and socialising in the welcoming warmth of the kitchen, drawing room or library. There are no televisions at The Lighthouse but Wi-Fi is available so guests can use their own portable devices. Reading material, games, sustenance & piano provided – conversation is up to the guests!